The locals call it “Chora”; a word that can be literally translated as “country” but that for Greek islanders is used to define the main towns of their homelands. 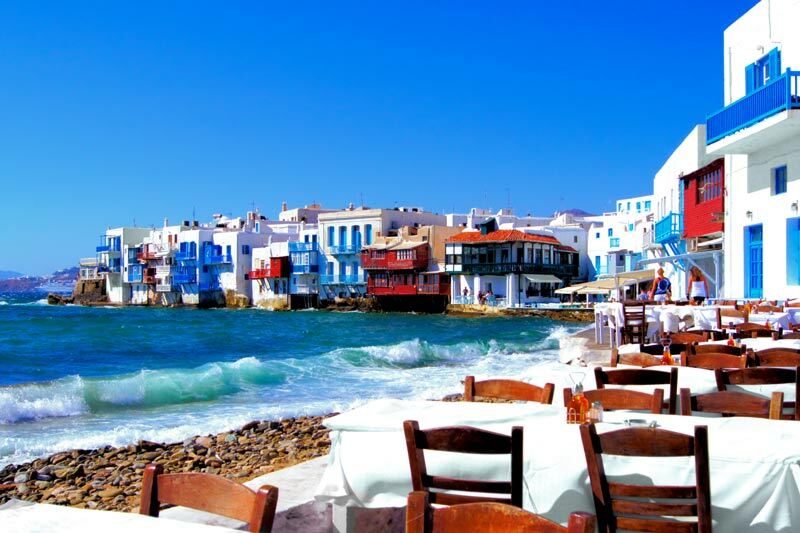 There are several Choras around the Aegean but Mykonos Town is without doubt the most beautiful and picturesque! 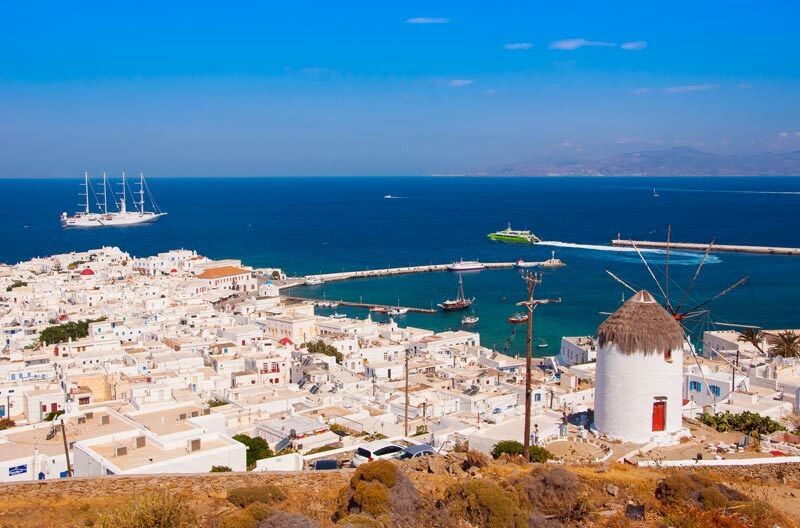 Whereas in many other islands these towns were built on top of hills in order to be easily protected from possible pirate attacks, the unusually large Chora of Mykonos is located by the sea and climbs up the hill either with narrow streets or with stairs. Full of small whitewashed houses with blue, green or red shutters, the town has two harbors: the old, usually full of dozens of colorful fishermen boats, and the new that can accommodate hundreds of tourists daily. 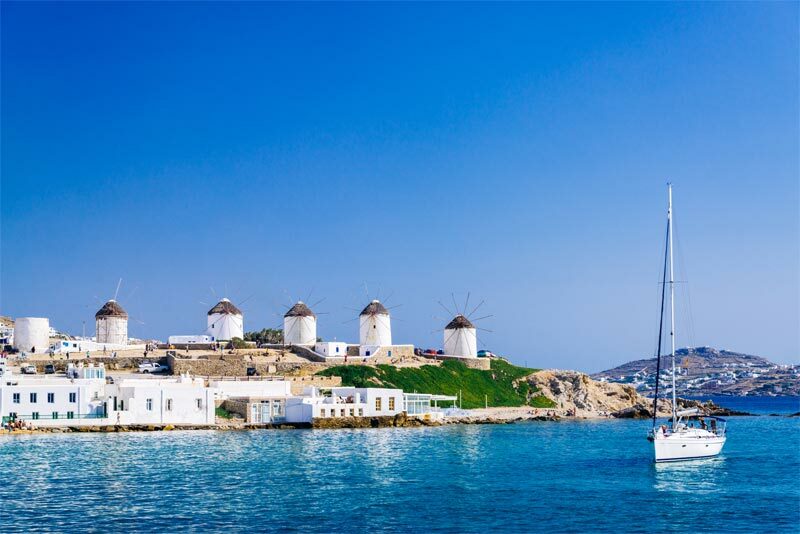 When approaching the island by sea, the first thing that attracts the visitor’s attention is the spectacular sight of the four windmills—trademark of Mykonos—overlooking the sea; like proud guardian angels with wings ever dancing to the strong meltemi wind. And then, once entering the small streets of Chora, the whistling sound of the wind suddenly seems to stop as it is hushed between the walls of the endless tiny streets; a true labyrinth designed to confuse any “invader”! But guests of Mykonos Town are not treated like invaders. On the contrary; they are always welcome like kings, enjoying from the first moment the famous Mykonian hospitality. For them, the town is full of surprises: exquisite restaurants and small fish taverns, exclusive little shops and fashionable boutiques, tiny cafés, and of course dozens of churches—including the renowned Panagia Paraportiani which is probably the most photographed church of the Aegean. Among the unparallel beauties of Mykonos Town, the Little Venice neighborhood with its’ colorful houses perched over the sea is a must! Before leaving, with your bags packed with the delicious local amygdalota sweets, plan a visit to the archaeological and maritime museums and also make sure that you pass by the famous Fabrica square that sets the borders between the core of the town and its outskirts. Last but not least, when back at the waterfront don’t forget to greet one of the proud pelicans hanging around the port’s cafés and bars, for they will be there to welcome you at your next visit!